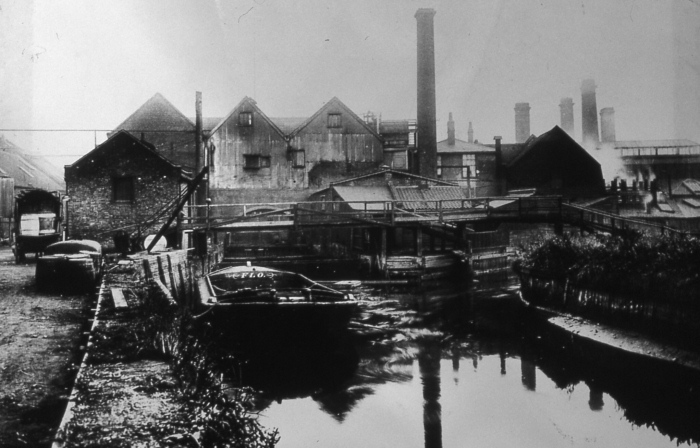 On the east below Old Ford Lock is the channel of the Old River Lea, leading to the entrances of Carpenters Road Lock and eventually (via the City Mills River) to City Mills Lock. Both of these were built as a result of a flood relief scheme in the 1930’s which also created the high concrete edges of the Bow Back Rivers. Both locks were named in opening ceremonies to honour local councillors, respectively Mr Ward and Mr Hollins. Both names have now been virtually forgotten. 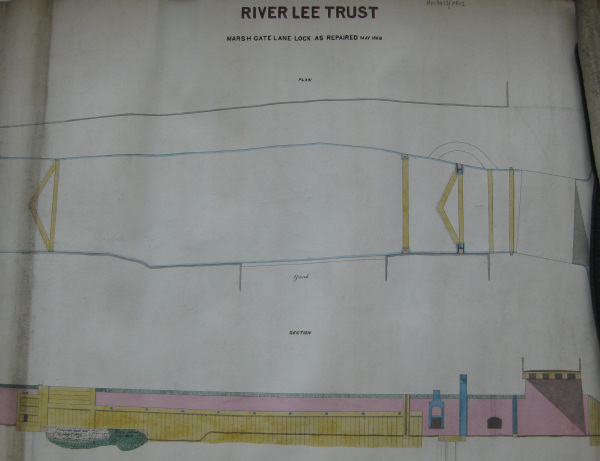 A plan in 1892 to alter the entrance to Pudding Mill River was deferred but a drawing from 1920 shows the intention not only to alter the entrance but to build new tide gates also. The abutments of the eastern set of gates still stand. Carpenters Road Lock was built in 1933-4 as part of a programme of improvement works carried out in accordance with the River Lee (Flood Relief) Act of 1930. 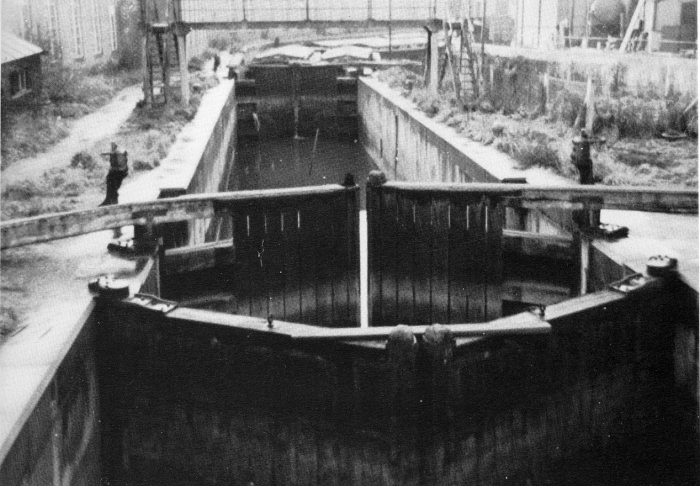 The Lock was the only one on the Lee Navigation to be fitted with rising radial gates, a type of lifting gate used on the continent but apparently never before in a British navigation lock. 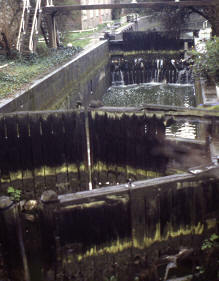 The Lock was one of only four in the country built with radial gates, one of only two that survive to the present day and the only one known to have been built with two such gates. 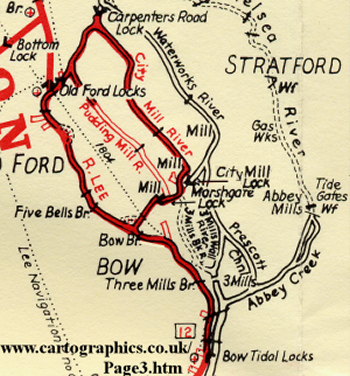 The lock house (top left) was complete by 15.2.1935 and ready for occupation. It was demolished soon after 1967. 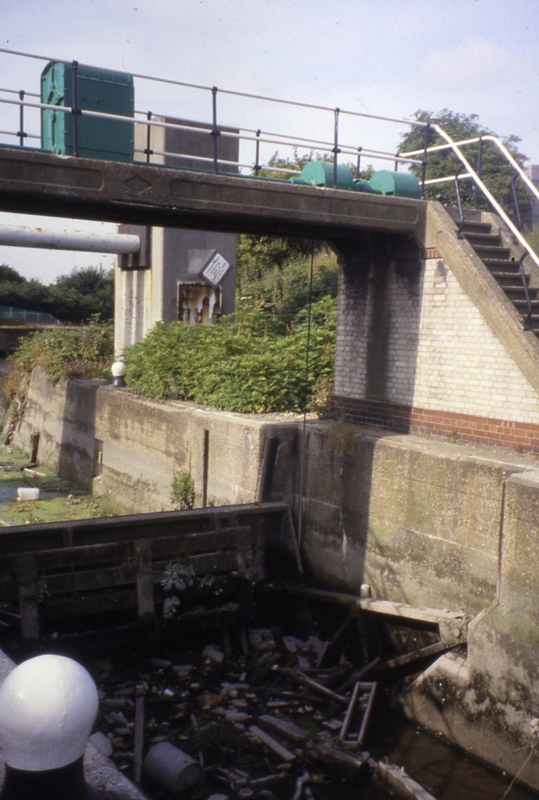 Radial gates were installed at Carpenters Road Lock because the lock was required both to maintain navigation and to discharge floodwaters. 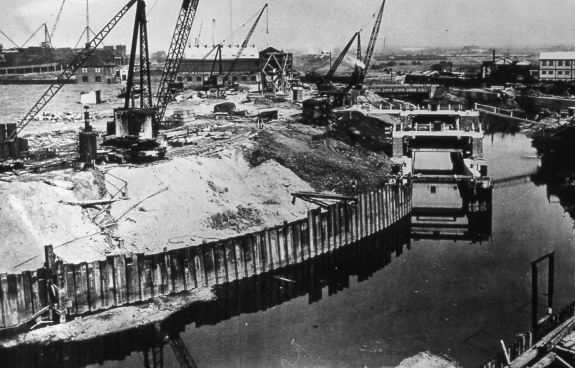 The situation at Carpenters Road Lock was complicated by the reversible head of water between the Waterworks River and City Mills River, which necessitated the installation of a second radial gate. The water level could be higher at either end of the lock. 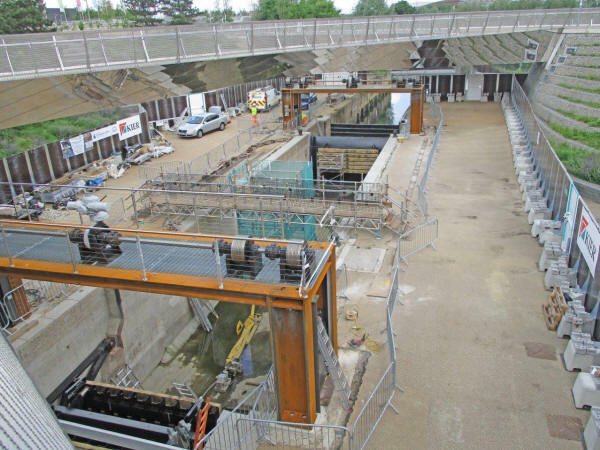 The arrangement of the counterweights and operating mechanism at Carpenters Road were an innovative solution to the challenges these conditions presented. Carpenters Road Lock southern gate, looking towards City Mills River. The Lock was directly beneath one of the approach bridges to the Olympic Stadium. Now the games are over, the intention is to restore the lock as a fully working navigable structure. The gates that are the most important historic aspect of the Lock are still in place but the gantries and associated ramps were demolished to make way for the bridge. The full width bridge has been dismantled leaving narrower structures which allow room for the Lock to be reconstructed. 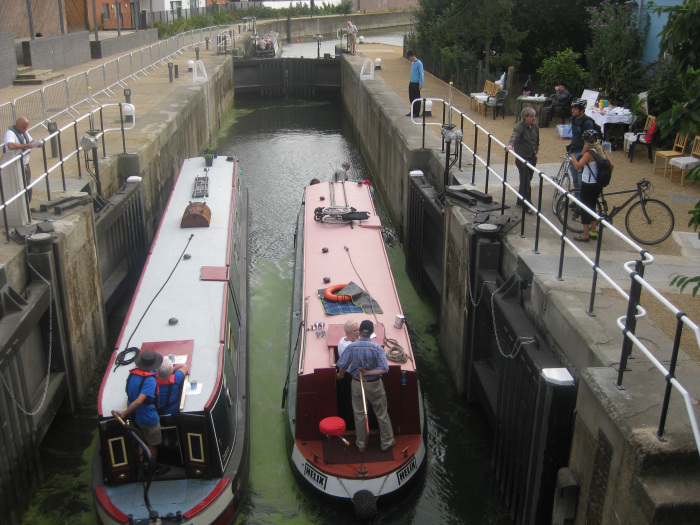 In February 2016, the go-ahead was given for the full restoration of Carpenters Road Lock, with an award of £1.75 million (sadly, not 175 million!!). Work in progress - Carpenters Road Lock looking north towards Waterworks River. The official re-opening of Carpenters Road Lock by Richard Parry, CEO of Canal & River Trust, on Monday 28th August, 2017. Two Olympians, Joe Clarke, MBE (kayaks) and Jessica Eddie (rowing) cut the tape. Job done! 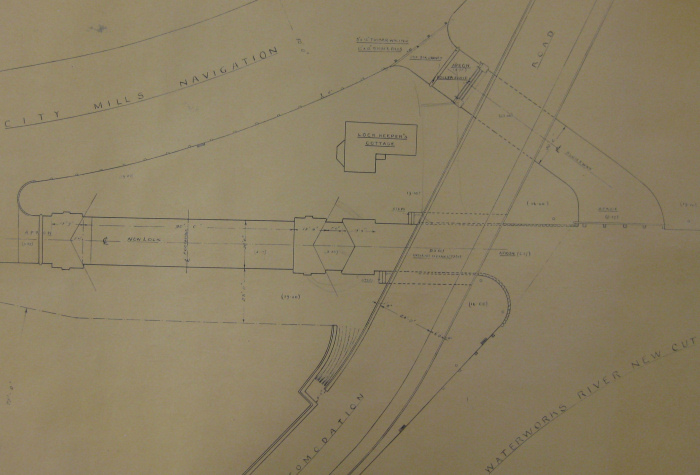 This drawing is dated 15.11.1932 and shows the layout for the new lock at City Mills. 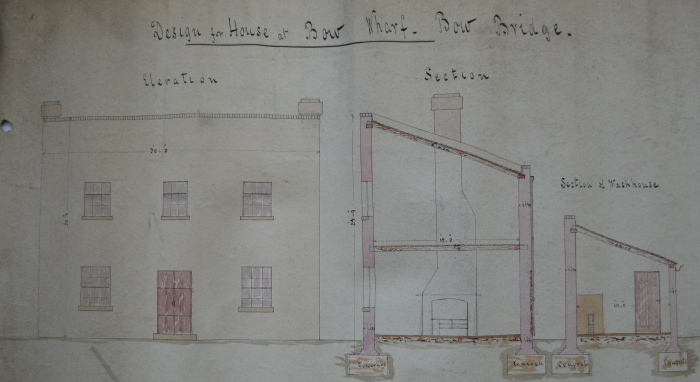 The plan shows the proposed lock house but the design in the photograph below is different. On 15.2.1935, the lock house here was reported as nearing completion. In 1967, the lock chamber looked like this when the present owners of the (just out of shot) lock house moved in. The nearer set of gates are to keep the high tides in the Waterworks River (which is connected to Bow Creek and thus the Thames) out of the lock as well as flood water from the Lea Valley. If these gates were opened, perhaps maliciously, the high water would push through and open both of the other sets of gates, allowing (as the tide or flood water fell) the entire pound between Limehouse and Old Ford to drain down! This happened on at least one occasion although the situation was rectified before all the water went! As can be seen in this photograph, the tide gates have been secured shut to prevent repetition. ....even without the balance beam! 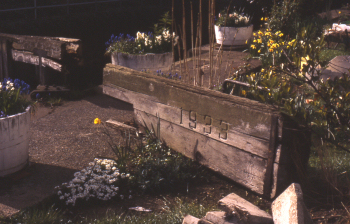 The old gates, which were becoming quite unsafe, were removed and replaced with stop planks in 2000. 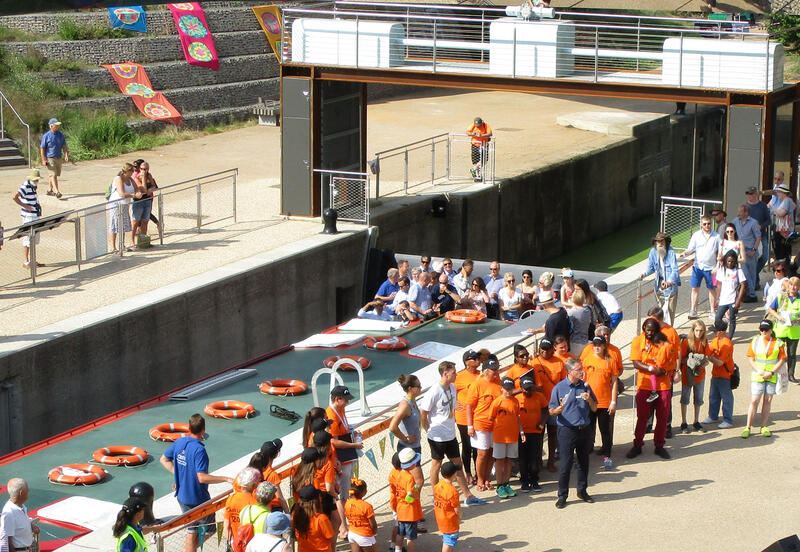 The lock was regenerated and regated during the preparation for the 2012 Olympics. It reopened to traffic on July 31st 2010. The "third" set of gates no longer protect against high tides because the Waterworks River is no longer tidal since the building of Three Mills Lock. They would however, still keep out excess flood water if it builds up. 65 on 1.3.1937. 11 years service. 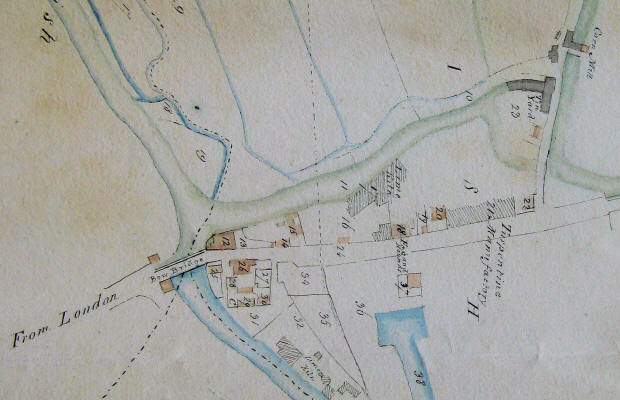 The map below is from about 1815 and shows, on the eastern side, the outfall of Pudding Mill Stream from St Thomas's Mills and the dog leg where Hunters Gates /Marshgate Lock will be built. 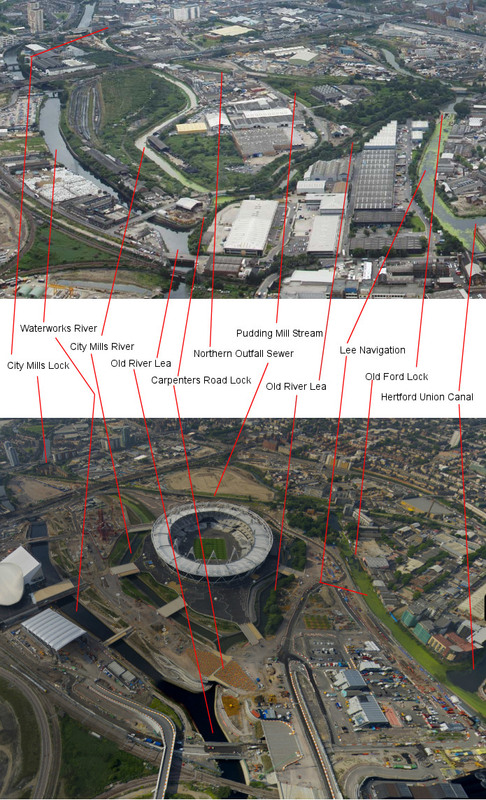 Towards the west is the confluence where the Back River rejoins the main Navigation which then passes under Bow Bridge. 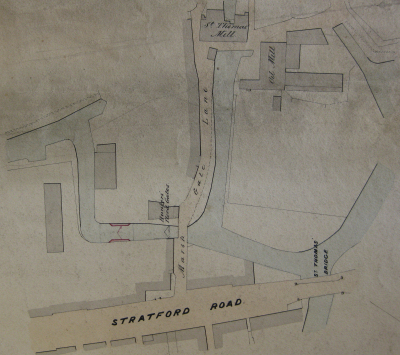 Hunter’s Gates were first recorded in 1847 and changed to Marshgate or Marshgate Lane Lock in 1864. Plan showing the proposed change from the single Hunters Gates to Marshgate Lock. 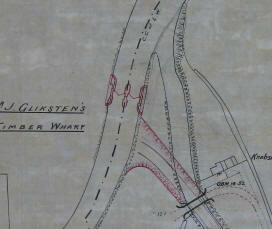 The completed lock in May 1868 - a rather unusual shape! 2.2.1885 "Cottage at Marshgate - I find we can rent (the cottage adjoining Marshgate Lock) at 7/6d per week...it will require a considerable amount of repairs which he (the agent) has undertaken to have done. (J Child) (LMA ACC 2423/002). 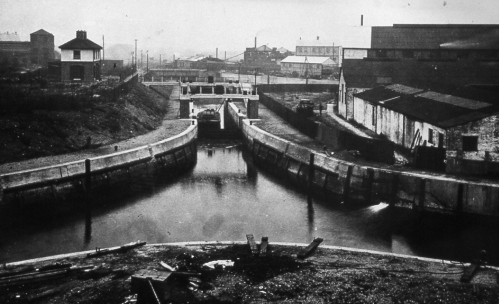 The image below shows Marshgate Lock just prior to its removal. This lock was levelled out in the 1930’s flood relief programme. 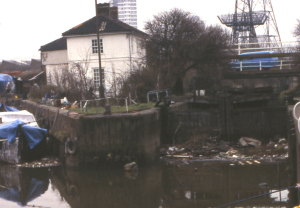 The Lock keeper later lived in the house on Bow Wharf which was destroyed by enemy action in World War II. “failed to attend to his duties at tide time on 6.10.1925. He had evidently been drinking and was not in a fit condition to do his duty.” One week’s notice given. 11.4.1924 Judge has signed undertaking to give up possession by 30.4.1924. 20.6.1924 Judge still in occupation. Request “ to rent 2 rooms until accommodation found” Refused. Legal proceedings be taken and Judges pension be stopped for the present. 16.1.1925 Judge still not given up occupation. Warrant to be applied for. 13.2.1925 Warrant executed on 2.2.1925. The house is now unoccupied. 13.3.1925 Pension of 12/- per week to be resumed from 2.2.1925.